After developing few popular robotic projects like line follower robot, edge avoiding robot, DTMF robot, gesture controlled robot, etc. in this project we are going to develop a bluetooth controlled robo car. Here we used a Bluetooth module to control the car, and it is also an android based application. Bluetooth controlled car is controlled by using Android mobile phone instead of any other method like buttons, gesture etc. Here only needs to touch button in android phone to control the car in forward, backwardd, left and right directions. So here android phone is used as transmitting device and Bluetooth module placed in car is used as receiver. Android phone will transmit command using its in-built Bluetooth to car so that it can move in the required direction like moving forward, reverse, turning left, turning right and stop. HC Bluetooth module consists two things one is Bluetooth serial interface module and a Bluetooth adaptor. Bluetooth serial module is used for converting serial port to Bluetooth. In this project we have used a toy car for demonstration. Here we have selected a RF toy car with moving left right steering feature. 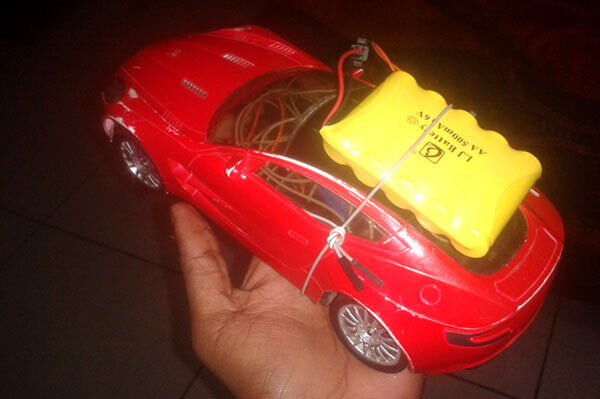 After buying this car we have replaced its RF circuit with our Arduino circuit. This car have two dc motors at its front and rear side. Front side motor is used for giving direction to car means turning left or right side (like real car steering feature). And rear side motor is used for driving the car in forward and backward direction. A Bluetooth module is used to receive command from android phone and Arduino UNO is used for controlling the whole system. Bluetooth controlled car moves according to button touched in the android Bluetooth mobile app. To run this project first we need to download Bluetooth app form Google play store. We can use any Bluetooth app that supporting or can send data. Here are some apps' name that might work correctly. After installing app you need to open it and then search Bluetooth device and select desired Bluetooth device. And then configure keys. Here in this project we have used Bluetooth controller app. When we touch forward button in Bluetooth controller app then car start moving in forward direction and moving continues forward until next command comes. When we touch backward button in Bluetooth controller app then car start moving in reverse direction and moving continues reverse until next command comes. When we touch left button in Bluetooth controller app then car start moving in left direction and moving continues left until next command comes. In this condition front side motor turns front side wheels in left direction and rear motor runs in forward direction. When we touch right button in Bluetooth controller app then car start moving in right direction and moving continues right until next command comes. In this condition front side motor turns front side wheels in right direction and rear motor runs in forward direction. And by touching stop button we can stop the car. In program first of all we have defined output pins for motors. And then in setup, we gave directions to pin. After this we read input by using serial communication form Bluetooth module and perform the operation accordingly. what is the significance of the study and what is the physics behind it? You can use one 12v power supply to power both the arduino and motors, but I think power is not the problem in your circuit. Have you made the ground common by connecting the negative supply of both the battery with the ground pin of arduino???? Can i use l298n motor driver ic in your circuit. Is it working? yes you can, but l298 is used where we need to draw high current (2A) and thats why we need heat sink with it. I want to combine voice and gesture controllable car . Is the front motor a servo motor? i use L298D for this circuit is it okay? i give 9V supply to both Arduino and L293D is it okay? And most important thing is please Provide me the whole and complete code to run this car. the BT app require any programming? Sir! How shud I use the servo motor to make the connection of arm with the same app controller? Sir,should the Bluetooth be slaved or mastered ? I was wondering if you could give me more details on the project and perhaps offer suggestions on how to add an obstacle avoidance capability... I was thinking of interfacing the system with a proximity sensor designed to alert the user and stop the wheels. Any suggestions? your web is very helpful for beginners to make projects in easy way. the first print is displaying but the second print is not displaying. SIR THERE IS PROGRAM ERROR PLEASE HELP ME. Please provide type proper code.It has so many Errors. Should we give any commands or coding to the bluetooth module? Did your pair your Bluetooth with Arduino?